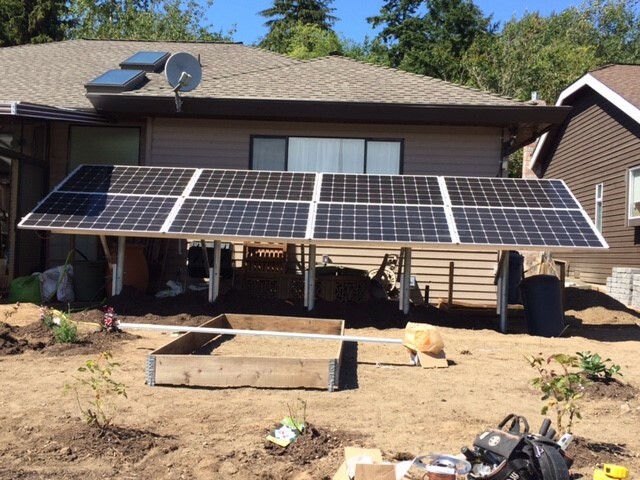 In February of 2016 Wekking Electric installed a 12 panel, 3.0 kW solar system on the roof of our house in Surrey, BC. The work was done very professionally and since the install the solar system has performed as promised. Wekking Electric installed a Solar Panel Photo-voltaic System including circuits, electrical panels, upgraded voltage system and rewired our aged system including installing LED lighting. Hans Wekking designed the system, navigated the municipal system of regulations and permits, and installed the structure and systems in record time. Hans Wekking worked tirelessly throughout, and at times I needed to insist that he take breaks. During this period Hans needed to address some family health issues, yet this did not interfere with the timely completion of the projects. Hans Wekking is very knowledgeable of the recent innovations in the solar photo-voltaics and can separate hype from sound engineering. Hans Wekking sourced the materials, sought out the best prices for quality materials, even arranged for the panels to be imported including customs permits. The ground structure was well designed and easily withstands winds of 100 km/hour. We have been very satisfied with the system and I currently talking with Hans Wekking about another project. I do not hesitate to recommend his company and service. I met Hans several years ago, when he did some work and on my home. Since then, Hans and his electricians at Wekking Electric have provided all services as needed on my properties and projects. It has been a natural progression, as a realtor, to refer Wekking Electric to my many clients for whatever electrical services they have required for homes they are selling, updating, or recently purchased. I especially appreciate Hans’ personal service, overseeing all phases of the project, offering suggestions for options that would improve original ideas. Hans also is very careful about his pricing, and working within each client’s specific budgets to deliver quality services and 100% satisfaction. It is always helpful that Hans approaches each project thoughtfully, efficiently and precisely – with clients’ needs and desired results first and foremost. Hans is very knowledgeable, kind, and considerate. That is reflected in the electricians and helpers he hires as well. Feedback from my many clients who have had work done by Wekking Electric is consistent with my experiences, making it easy to always refer his company to take care of the full spectrum of anyone’s electrical needs. Wekking Electric has taken care of our company requirements in a professional and honest manner for every one of those years. Not only is the work taken care of in a timely and correct manner, it is done with minimum upset to the daily routine in our offices, and the billing rate is very reasonable. Wekking Electric has always looked out for our best interests, and I can’t imagine any other firm handling our electrical installation and maintenance needs. We are extremely happy with the outcome! Hans is not only knowledgeable, competent and thorough, but is a good communicator; arriving when he says he’ll be at our home! We would not hesitate to recommend him for any electrical job; big or small. He has been a positive person to have on site. We have been very impressed with the electrical work by Wekking Electric. Hans, the owner, always schedules the work in a way that meets the customer’s needs and schedule. Also he is dependable, and professional and performs the duties with competance. The job is done right the first time. Above all we appreciate his commitment to honesty and integrity of his business practices. We would recommend Wekking Electric for any job large or small, he will always come through. Here are few things to mindfull of when hiring an electrician for your home or business. A non licensed company will not be able to offer bonding, insurance and permits. If there is a problem in your home or business you may not have any coverage from your insurance company to fix or repair your home or business. Your home or business is your largest asset, and your family’s safety is priceless. Why take a chance with a non licensed contractor?